In a series of letters, Robert Walton, the captain of a ship bound for the North Pole, recounts to his sister back in England the progress of his dangerous mission. Successful early on, the mission is soon interrupted by seas full of impassable ice. Trapped, Walton encounters Victor Frankenstein, who has been traveling by dog-drawn sledge across the ice and is weakened by the cold. Walton takes him aboard ship, helps nurse him back to health, and hears the fantastic tale of the monster that Frankenstein created. Armed with the knowledge he has long been seeking, Victor spends months feverishly fashioning a creature out of old body parts. One climactic night, in the secrecy of his apartment, he brings his creation to life. When he looks at the monstrosity that he has created, however, the sight horrifies him. After a fitful night of sleep, interrupted by the specter of the monster looming over him, he runs into the streets, eventually wandering in remorse. Victor runs into Henry, who has come to study at the university, and he takes his friend back to his apartment. Though the monster is gone, Victor falls into a feverish illness. Sickened by his horrific deed, Victor prepares to return to Geneva, to his family, and to health. Just before departing Ingolstadt, however, he receives a letter from his father informing him that his youngest brother, William, has been murdered. Grief-stricken, Victor hurries home. While passing through the woods where William was strangled, he catches sight of the monster and becomes convinced that the monster is his brother's murderer. Arriving in Geneva, Victor finds that Justine Moritz, a kind, gentle girl who had been adopted by the Frankenstein household, has been accused. She is tried, condemned, and executed, despite her assertions of innocence. Victor grows despondent, guilty with the knowledge that the monster he has created bears responsibility for the death of two innocent loved ones. Hoping to ease his grief, Victor takes a vacation to the mountains. While he is alone one day, crossing an enormous glacier, the monster approaches him. The monster admits to the murder of William but begs for understanding. Lonely, shunned, and forlorn, he says that he struck out at William in a desperate attempt to injure Victor, his cruel creator. The monster begs Victor to create a mate for him, a monster equally grotesque to serve as his sole companion. Victor refuses at first, horrified by the prospect of creating a second monster. The monster is eloquent and persuasive, however, and he eventually convinces Victor. After returning to Geneva, Victor heads for England, accompanied by Henry, to gather information for the creation of a female monster. Leaving Henry in Scotland, he secludes himself on a desolate island in the Orkneys and works reluctantly at repeating his first success. One night, struck by doubts about the morality of his actions, Victor glances out the window to see the monster glaring in at him with a frightening grin. Horrified by the possible consequences of his work, Victor destroys his new creation. The monster, enraged, vows revenge, swearing that he will be with Victor on Victor's wedding night. Later that night, Victor takes a boat out onto a lake and dumps the remains of the second creature in the water. The wind picks up and prevents him from returning to the island. In the morning, he finds himself ashore near an unknown town. Upon landing, he is arrested and informed that he will be tried for a murder discovered the previous night. 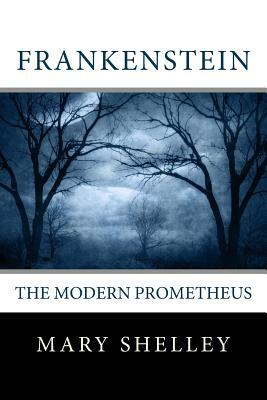 Mary Wollstonecraft Shelley (nee Godwin; 30 August 1797 - 1 February 1851) was an English novelist, short story writer, dramatist, essayist, biographer, and travel writer, best known for her Gothic novel Frankenstein: or, The Modern Prometheus (1818).